This is the the User Manual for Valkyrie3918. Valkyrie3918 is a PC application that lets you perform advanced IP multicast network tests according to the IETF RFC 3918 standard using one or more of Xena Valkyrie test equipment chassis. Enables the user to create, edit and execute test configurations using Xena Networks test equipment in accordance with IETF RFC 3918 standard. Full support for all test-types specified in RFC 3918 . Ability to partially enable one or more of the test-types. Support for all IGMP/MLD versions. Support for multiple ValkyrieBay and ValkyrieCompact test chassis. Ability to flexibly define the protocol layers supported by the test (Ethernet, Customer and Service VLANs, IP and UDP). Test reports can be created in either PDF or XML format or both. Extensive configuration options to fine-tune the tests. Valkyrie3918 is a standard Windows .NET application supporting Windows XP (SP3) and all later Windows versions. It requires Microsoft .NET version 4.0. After installation you can find a shortcut to the application either in the Start -> Programs -> Xena Networks menu or (if you have selected this during setup) on your desktop. The application is installed as part of the Xena software release package which can be obtained here. Refer to this page for details on support for Linux. This section provides explanations for the terminology used by the Valkyrie3918. Test Type Denotes one of the test types defined in RFC 3918, sections 4 to 8, such as “Mixed Class Throughput” and “Multicast Latency”. Trial A “trial” denotes a single execution of a test with a given set of test parameters. If the test configuration specifies that the tests shall be performed at various packet sizes a number of trials will then be executed – one for each packet size specified. Iteration Each test type can be configured to repeat the test a number of times. Each of these repetitions is called an iteration. One iteration may comprise several trials. At the top you find a menu bar with accesses various application-level functions. You also find a toolbar with quick shortcuts to the most used functions. 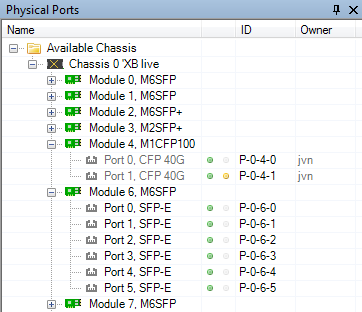 At the left you find a tree view named “Physical Ports” showing the available Xena chassis, modules and ports. At the right you find a tabbed view with various application panels. These are explained below. Start Page The default main page shown to the user. This page contains a brief guide to assist you in creating an initial test configuration. You can close this panel once you feel that it is no longer useful to you. Selected Ports This panel allows you to include Xena testports in your test and to configure the behavior of these ports. You select the ports in the Physical Ports view and drag them to the Selected Ports panel to include them in the test. Test Configuration This panel controls all aspects of the Test Configuration, including the selection of the actual tests to perform. Multicast Configuration This panel controls all aspects of the Multicast flow configuration. Unicast Configuration This panel controls all aspects of the Unicast flow configuration. The Unicast configuration is used in a number of the available tests as background traffic. Reporting Options This panel control all aspects of the reporting function. Result Data This panel displays the test data in a grid view. Configuration Errors This panel displays any configuration errors detected in your configuration when attempting to start a test. Aggregated Multicast Throughput. This test determines the maximum zero-loss throughput rate for N destination interfaces of the same multicast groups. It is similar to the Throughput test from RFC 2544 but uses multicast traffic exclusively. Mixed Class Throughput. This test determines the maximum zero-loss throughput rate of a DUT/SUT when both unicast class frames and multicast class frames are offered simultaneously to a fixed number of interfaces as defined in RFC 2432. It is similar to the Throughput test from RFC 2544 but uses a mix of unicast and multicast traffic. Scaled Group Forwarding Matrix. This test determines the Forwarding Rate as a function of tested multicast groups for a fixed number of tested DUT/SUT ports. It is similar to the Loss test from RFC 2544. These two tests have been combined into one test in the Valkyrie3918 as both tests can be executed by the same test procedure. The tests produces a set of multicast latency measurements from a single, multicast ingress interface of a DUT/SUT through multiple, egress multicast interfaces of that same DUT/SUT. The test is similar to the Latency test in RFC 2544 but measures exclusively the latency between the single source port and the destination port(s). These two tests have been combined into one test in the Valkyrie3918 as both tests can be executed by the same test procedure. The Join test determine the time duration it takes a DUT/SUT to start forwarding multicast frames from the time a successful IGMP group membership report has been issued to the DUT/SUT. The Leave test determine the time duration it takes a DUT/SUT to cease forwarding multicast frames after a corresponding IGMP Leave Group message has been successfully offered to the DUT/SUT. The test determine the maximum number of multicast groups a DUT/SUT can support while maintaining the ability to forward multicast frames to all multicast groups registered to that DUT/SUT. These tests are similar to the Group Join Delay and Multicast Latency tests but with additional meshed unicast traffic being sent through the DUT from a set of separate ports. This section explains how to get started using the Valkyrie3918 to execute a few simple tests. The test configuration will consist of one multicast source port and two multicast destination ports. It will not use any unicast traffic ports. Press the Add Chassis button in the menu bar. Enter the address and password of the Xena chassis you want to use. Press the OK button and wait until the application has successfully connected to the chassis. Locate the three ports you want to use in the left-most Physical Ports tree view, right-click them and choose the Add Port to Test Configuration. You can either select them one by one or perform a multiple-selection by holding down the Ctrl key while selecting port ports with the mouse. Set the role of the port you want to use as the multicast source port to MC Source. Set the role of the two other ports to MC Destination. Set the IP address, routing prefix and Gateway address for each of the ports. Change to the Test Configuration panel. Leave the options in the General Test Options subpanel at their default values. Change to the Test Types Selection and Configuration subpanel. Ensure that only the “Group Join/Leave Delay”, “Aggregated Multicast Throughput” and “Multicast Latency” tests are enabled (checked). Leave the options for all enabled subtests at their default values. Change to the Multicast Configuration panel. Ensure that the IGMP/MLD Version is set to a version supported by your DUT. Check that the Start Address in the Multicast Address Range seciton is supported by your DUT. You will only need a single multicast group address for the selected tests. Check that the Packet Rate option is set to a value which is sensible for your DUT. The Ethernet Source MAC address will be set to the MAC address of the port. The Ethernet Destination MAC address will be set to the multicast MAC address according to RFC 1112, section 6.4. The Source IP address wil be set to the address specified for the port. The Destination IP address will be set to the multicast group address. Save your configuration by clicking the Save button in the toolbar or by pressing <Ctrl-S> on the keyboard. Provide a filename for the configuration when asked. Start the test by clicking the Start button in the toolbar. The Result Data panel at the bottom should not be shown automatically and will allow you to follow the progress of the tests. When all selected tests have completed the final PDF report should be opened in your default PDF viewer application. This section explains the options available in the various configuration panels. View the current sync (link) and traffic state of the ports. View the ownership of the ports, i.e. are the ports reserved and by whom. Request or relinquish ownership of ports. Determine which ports will be used in the multicast tests. You can reserve or relinquish ownership of a port by right-clicking on it and selecting the appropriate action. Note that the Valkyrie3918 will automatically reserve ownership of used ports when a test is started. Port Name The name (ID and type) of the port. MC Port Role The role this port plays in the overall test configuration. See below for a description of the rules for port role assignment. Port Speed The physical port speed to use in the test. Normally this should be left at the default AUTO value, but certain DUTs require that the port speed is fixed to a specific rate. IP Address The IP address that you want to use for the port. All ports in the configuration need an IP address. Prefix The decimal network prefix for the address. Gateway Address The gateway address for the assigned IP address. Usually this will be the address of the DUT port which the test port is connected to. There must be exactly one Multicast Source (MC Source) port. The MC Source port is the port that acts as the multicast server and transmits the multicast traffic to the multicast groups. There must be at least one Multicast Destination (MC Destination) port. The MC Destination ports act as the multicast clients and will receive the traffic sent to the multicast groups. If the selected tests require burdening traffic there must be at least two Unicast Burdening (UC Burden) ports. Burdening ports are used to emulate additional unicast traffic to burden the DUT. Select the Selected Ports Panel. Then select the port in the Physical Ports panel and drag it to the Selected Ports Panel. Right-click the port in the Physical Ports panel and select the Add Port to Test Configuration menu option. Select the port(s) you want to remove from the test in the Selected Ports Panel. Then you can either press the Remove Port button at the lower right or right-click on the port and select the Remove Port menu item. Right-click the port in the Physical Ports panel and select the Remove Port from Test Configuration menu option. This panel contains options that control the actual execution of the tests. It also allows you to select exactly what tests to run. This sub-panel contains general options that affect all selected tests. Using this option you can select the packet sizes to use in the test. If you select one of the options from the Fixed Sizes Per Trial section the tests will be repeated for each packet size selected. If you select one of the options from the Varying Sizes Per Trial only one trial will be executed. Latency Mode: Determines the mode used to measure latency. Latency Unit: Determine the unit which is used to report latency measurements. Jitter Unit: Determine the unit which is used to report jitter measurements. Toggle Sync State: If selected the port sync states will be toggled off and on between each trial. This sub-panel allows you to select which tests to perform and to configure the options for each test. The tests are grouped according to RFC 3918. To enable a test just make sure that the checkbox next to the test name is checked. To configure a test select the test in the treeview and set the options in the panel to the right. Each test type is associated with a set of test options. All available test options are described below. Note that all options do not apply to every test type. Duration: The duration in seconds of the time used in each trial for the actual measurement. This does not include the test setup and teardown phases so the total duration of a test will be longer. Traffic-to-Join Delay: The number of seconds to wait between starting the multicast traffic on the server and sending the Join requests from the clients. This delay ensures that we can accurately check that traffic is not received by clients before they Join the multicast groups. Leave-to-Stop Delay: The number of seconds to wait between sending the Leave requests from the clients and stopping the multicast traffic on the server. This delay ensures that we can accurately check that the Leave requests from clients are actually honoured by the server before stopping the traffic. Multicast Group Count: If present this option allows you to define a multicast group count sweep with a start, end and step value. Multicast Group Count Selection: If present this option allow you to specify a series of multicast group counts which can be used if multiple iterations have been configured. Initial Rate: If present this option denotes the initial rate in percent of the overall rate configured in the Multicast Stream panel. Maximum Rate: If present this option denotes the maximum rate in percent of the overall rate configured in the Multicast Stream panel. Minimum Rate: If present this option denotes the minimum rate in percent of the overall rate configured in the Multicast Stream panel. Step Rate: if present this option is used to increment the rate percentage when iterating from a starting to a maximum rate. Resolution: If present this option denotes a minimum difference between rates which will be used to stop the iteration. Unicast Traffic Ratio: If present this option denotes the percentage of the overall rate configured in the Multicast Stream panel to be used for unicast traffic. Note that the unicast rate will be added to the configured multicast rate. So if the multicast rate has been set to e.g. 10% and the UC traffic ratio is set to 50% the total rate for the port will be 10% + (50% of 10%) = 15%. This panel contains configuration options that control the generation of multicast traffic. This sub-panel defines the common multicast options. These are explained below. Protocol Profile: The protocol segment profile to use for the multicast traffic. IGMP/MLD Version: Specifies the IGMP or MLD version to use. Note that the IP version is implicitly selected in the Protocol Profile option described above. Start Address (IPv4): The starting address to use when allocating a multicast group address sequence. Only valid if IPv4 is selected through the protocol profile. Start Address (IPv6) The starting address to use when allocating a multicast group address sequence. Only valid if IPv6 is selected through the protocol profile. Step Value The step value used to increment the address when generating a multicast group address sequence. Join Refresh Interval: The interval in seconds with which the join requests will be retransmitted. This is useful for longer-running tests where the router may otherwise timeout the individual learning requests. Join/Leave Rate: The maximum rate with which the IGMP Join or Leave packets are sent. This is used to spread out the request transmission to prevent the DUT from being overwhelmed and drop requests. Use Source Address: If selected the multicast address will be added as a source address to the IGMPv3/MLDv2 Group Record in the Join/Leave requests. If not selected the Group Records will not contain any source addresses. See RFC 3376, section 4.2.9 for details. Payload Type: The type of test payload in the packets generated by the MC source port. Pattern: If the payload type has been set to “Pattern” you can specify the pattern here. Fraction: This option allows you to specify the overall rate used for the multicast stream as a percentage of the physical port rate. Packet/sec: This option allows you to specify the overall rate used for the multicast stream as a packets per second value. This panel contains configuration options that control the generation of unicast traffic. This sub-panel defines the protocol segments used for the unicast traffic generated by the relevant ports. Refer to the description for the equivalent multicast protocol segment panel above. 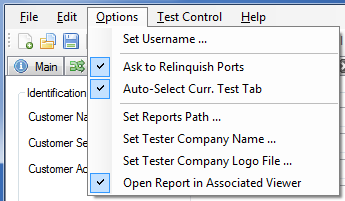 The Reporting tab contains a number of options that affect the way reports are generated for the test. This section contains a number of options that can help identify the test context. Customer Name: The name of the customer for which the test is performed. Customer Service/Access Id: These two options allow you to provide details about the network circuits you are testing. Comments: Allows you to provide any multi-line comments for the test configuration. This section contains options that affect the way reports are generated. Report Filename Prefix: Specifies the prefix for the report filename. Append Timestamp to Filename: If checked a timestamp on the form <YYYYMMDD-HHMMSS> is appended to the filename prefix. Include Graphs in Report: If checked the report will include bar charts showing the test results. This is only applicable for PDF type reports. This section allows you to select which types of reports will be generated. You can enable several types. The generated report files will be given a file extension that matches the selected type, i.e. “.pdf” for PDF files and so forth. You can find the specification for the XML Report here. This panel will show any configuration errors detected by the program when you attempt to execute a configuration. If any such errors are found the panel will be shown and the execution attempt will be aborted. You will have to correct any reported errors before the program will allow you to execute the configuration. Each error will be shown in a separate line in the panel. If you double-click on an error message you will be taken to the relevant configuration panel that will allow you to correct the error. This panel is by default found in the lower auto-hiding panel group. By “auto-hiding” we mean that the panel is initially hidden but will popup either if the panel tab is clicked or if the Valkyrie2889 program decides that it is necessary to direct the attention of the user to the panel. You can make the panel visible always by clicking the little “pin” icon in the top-right of the panel header. The Valkyrie3918 application features a number of application-level settings which are valid for all test configurations. These can be accessed in the Options menu item as shown in the figure below. Set Username: Allows you to specify the username used when logging in to the Xena testers. The default value will be your Windows username (shortened to 8 characters if longer). Ask to Relinquish Ports: If checked the Valkyrie3918 will prompt you when you try to use a port which is currently reserved by someone else. If unchecked the Valkyrie3918 will unceremoniously relinquish the port and reserve it in your name. Open Last Configuration On Start: If checked the configuration you had open when you last closed the application will automatically be opened the next time you start the application. Set Reports Path: Allows you to specify a different location for the generated reports. The default location is <ProgramData>XenaNetworksXena3918Reports. The location of<ProgramData> varies between versions of Windows but can be obtained by inspecting the environment variable “ProgramData”. Set Tester Company Logo File: Allows you to specify the path to an image file which will be used as the logo in the reports. 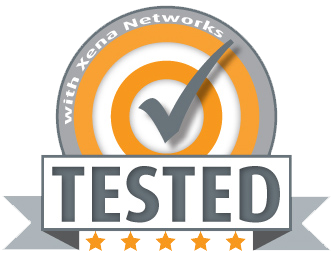 The default logo is the Xena Networks logo. The image can be in PNG or JPG format. It should have the approximate dimensions of 150 x 60 pixels and be set to a DPI of 96. Open Report in Associated Viewer: If checked the Valkyrie3918 will attempt to open the generated report in the associated viewer. This is currently only applicable for PDF reports. This requires that a suitable PDF viewer (such as the Adobe Acrobat Reader) is installed on your PC. The Valkyrie3918 supports a number of command line options which can be used to automate the execution of a predefined configuration file. Valkyrie3918 is the first application in the Xena test tools series that does not require a separate executable file to perform the command line functionality. The same executable (xena3918_<version>.exe) is used for both the GUI and the command line functions. -c, –config Load a test configuration file with the specified path. -e, –execute Execute the specified test configuration file (requires -c <file>). If this option is used the program will not show the GUI but will run in command line mode. -u, –user Set the username used when logging on to Xena testers (default: xenarun). -r, –reportpath Set the path where reports are saved. -o, –company Set the company name used in reports. -l, –logo Set the path to the report logo file. -h, –help Display this help screen. Please refer to this page for further details about troubleshooting the Valkyrie3918. ^ With the exception of the “Encapsulation/Decapsulation” types.